ESCONDIDO -- It seems no matter what La Costa Canyon junior Jessica Riedman does, she can't seem to bask in the spotlight for long. 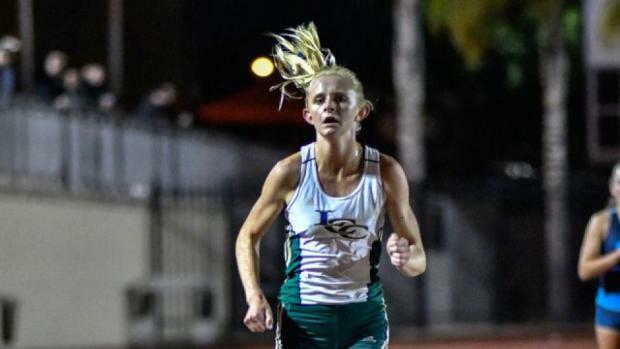 An hour after winning the Escondido Invitational 800-meter run in 2:13.70, just off her best of 2:13.53, she and all the others in the meet became a footnote after teammate McKenna Brown took down the section 3200-meter record with an amazing solo run of 10:15.97. When Torrey Pines' Alli Billmeyer clocked a 10:18.92 in 2011, at least she had Rancho Bernardo's Molly Grabill (10:19.17) pushing her every step of the way. Two other runners were under 10:30. Brown (Clark Kranz photo above) took off right from the starting gun and when she crossed the line at the mile mark, the big clock on the side of the track flashed 5:07. She led by 100 meters. As she headed into the final 400, announcer Don Jones, who was right on top of her splits every step of the way, urged the crowd to get behind Brown who still had plenty left. As she came down the final straightaway, he counted down the time so everyone knew, even those who couldn't see the clock, that she was the new standard-bearer. She was a minute ahead of second place. "I knew the record was 10:18 but all I was looking for was something under 10:20," said Brown while being smothered with well-wishers. "It was in the back of my mind but when I saw the 5:07, I knew I had a chance. All the good runners evenly split their first and second mile and I knew I had it if I could do that. This is only my second 3,200 of the season." She used a tactic that has been employed by every distance runner to keep up the pace-she started counting the runners she was lapping, using them as a target even as she had to swerve around them. "This race will make me stronger for State," said Brown, who is No. 2 in CA in the 1600 (4:45.46) and will run that event in Clovis in June for sure. Since there are no 3,200 prelims and the 3,200 is after the 1600, she isn't discounting a double. She couldn't be happier for a teammate who made her feel right at home when she was talked into going out for track her freshman year when she still thought she was a soccer player. "There are no ill-feelings," she said when asked if there might be some running in the long shadow of Brown and 3,200-meter standout Kristin Fahy, another junior. "Honestly, I'm really going to miss (Brown). When she ran 4:51 last year, I was in the next heat and that inspired me. And then when she won at Arcadia this year, I couldn't have been happier. "We are a really close group, we've bonded and have great camaraderie. Coach (Bill) Vice makes it so much fun." Riedman is a coach's dream, posting times of 2:13.52 (800), 4:51.47 (1600) and 11:14.27 (3,200). Talk about versatile. As for Fahy, all she did was drop down to win the 1,600 in 4:52.14. "That felt just like practice-smooth," said the 10:22.53 3200-meter runner. "I just ran 4:54 last week and I think this will help me. I'm running five seconds faster in the 1600 so I hope that means I can still run five seconds faster in the 3200." Another LCC standout, junior Karson Lippert, clearly was frustrated by his victory in the 400 where each week prior to Friday night he'd lowered his time. The State runner-up at 46.91 as a sophomore was looking for a time in the low 47s but ran 48.09. When he heard his time announced, he just shook his head. "I took it out too fast," said Lippert who usually hangs back a little and then closes with a rush. There was some wind with which to contend but he said he didn't really feel it. "I think I have 100 percent room to grow," said Lippert. "I know I can get under 46.91, I just need the right race. I look at video of the state finals before every big invitational to remind myself how I run the 400 best." Lippert (Clark Kranz photo above) had a dramatic drop at state last year and says he's looking forward to league and section leading up to the state meet. One thing he knows for sure: having lost twice already this year (Arcadia and Mt., SAC), it will take a time faster than 47 to win state. All of the invitationals these days have fully automatic timing. But what happens if someone hits the wrong button and there are no results? That's what happened in the 100-meter dash where Madison's Kenan Christon (10.58 PR), Mt. 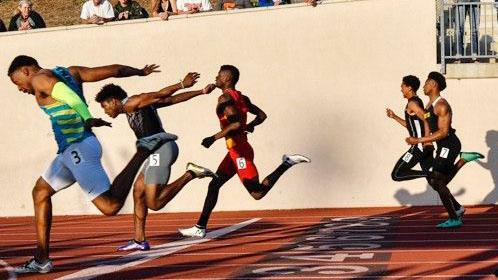 Carmel's Quoi Ellis (10.69) and Long Beach Poly's Kejuan Markham (10.89) crossed the finish line together (Clark Kranz photo above). Markham finished with a rush and the two San Diegans were side-by-side the whole race. First they waited on the track. Then they waited on the infield as secondary 100s were run. Then came the dreaded announcement asking the coaches of the 100-meter runners to meet on the field. The timing devise had been shut off by accident so there were no times. Hand times from the stands were right around 10.6 and there was zero wind. Asked if they wanted a rerun, the coaches declined and there was no official result. You'd be hard-pressed to find an athlete more upbeat than Coronado junior Alysah Hickey. Although her marks in the winning the 100 and high jump were below her bests, she still found positive things about both events as well as learning not to do too much. After going straight from the 4x100 relay to try 5-5 in the high jump, she was told she'd need to check in for the long jump. Realizing that was too much, she scratched the long jump, and tried focusing on the high jump. She cleared 5-7 but after making 5-8, 5-9 and 5-10 in successive weeks, she couldn't top 5-9 and was pretty disappointed. Then she ran a 12.29 100, well off her best of 11.87. She was still all smiles. "I'm excited about what I've done, maybe I can get in the 200," said Hickey, laughing. "I like doing a lot of events, I'm just like Kenan (Christon). I had a sinus infection this week and I felt it after the 100. Still, I'd like to have done 5-9 but I can remember when I never thought I'd clear 5-7." At least she set a meet record in the high jump. Cathedral Catholic's Joaquin Martinez de Pinillos turned more than a few heads when he scorched a 60-second first lap of his 1,600. That's sub-4 minute mile pace. He not only slowed down, he actually was passed by Serra's hard-knocking Anthony Benitez before rallying to win in 4:15.93. Afterward Benitez told his league rival, "I thought maybe you thought it was an 800," and they both had a good laugh. 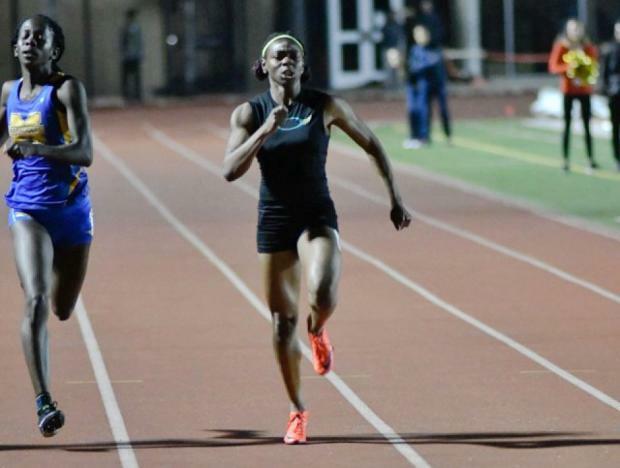 Long Beach Poly, making a rare trip south, showed its power right away when the Jackrabbits won the 4x100 relay in 42.08, well off their best of 41.76 but two-tenths ahead of fast-closing Steele Canyon that ran the fastest time in the San Diego Section this season at 42.28. San Dieguito's Kevin Ward, who soared 16-1 in the vault in March, cleared 15-9 and had a close miss at 16-3. He says he's been hitting 16-2 in practice.